Length: 500 meters (40 meters wide) // Runway 13 and 31 has an additional 50 meters overrun on each end. IMPORTANT: You must establish radio communication 40DME from PUT VOR Phuket Approach 124.7 of Phuket International Airport // You must have an WRITTEN INVITATION FROM PHUKET AIRPARK www.phuketairpark.com before landing, because this invitation is faxed to Phuket International Airport so they are aware of your arrival and can vector you to Phuket Airpark. 1. RWY from numbers to numbers (13/31) is 500m. 2. Landing: Due to growth of trees (100’ tall) during last 1-2 years on West end for approach Rwy 13 it is recommended a RWY 31 usage for landings, even with 1-7kts tail winds. 5. Anyone planning to arrive Phuket airpark is welcome to contact me directly for changes or other information. 1. You must have a transponder. 2. Contact Suchard - phuketairpark1@gmail.com // Tel: 087-4178399 - and ask for an invitation to fly to Phuket Airpark. 7. Call Phuket Tower to cancel Flight Plan after landing -- FLIGHT PLAN PHONE: 076-327205. 1. Call Suchard -- 087-4178399 -- and advise him you want to leave Phuket Airpark. 2. File a Flight Plan one hour before departure -- FLIGHT PLAN PHONE: 076-327205. 3. Call Phuket Tower and advise prior to take off -- TOWER PHONE: 076-327269. 6. If you fly more than 10DME from Phuket VOR and stay below 1,000', you do not need to talk to Phuket Approach because of terrain reception difficulty. 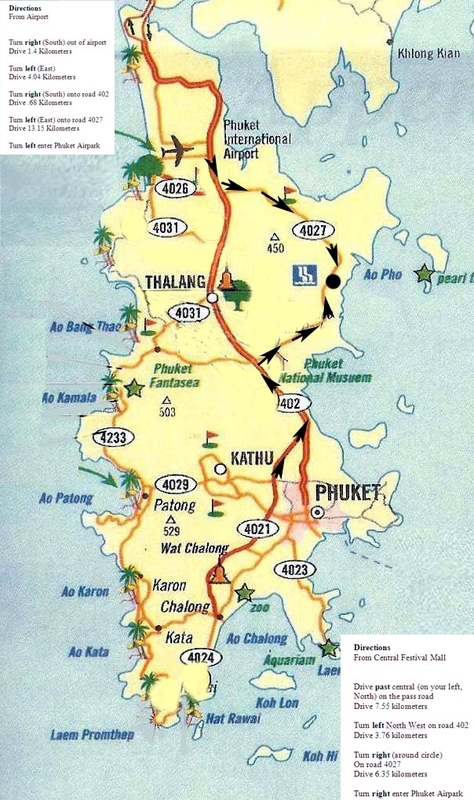 Road Directions: From Phuket International Airport: Turn right (South) out of airport - Drive 1.4 Kilometers. Turn left (East) - Drive 4.04 Kilometers. Turn right (South) onto road 402 - Drive .68 Kilometers. Turn left (East) onto road 4027 - Drive 13.15 Kilometers. Turn left enter Phuket Airpark. From Central Festival Mall: Drive past central (on your left, North) on the pass road - Drive 7.55 kilometers. Turn left North West on road 402 - Drive 3.76 kilometers. Turn right (around circle) - On road 4027 - Drive 6.35 kilometers. Turn right enter Phuket Airpark.